The celebration of the 5-th anniversary of the Institute "Kundawell"
"Second International Forum on original thinking in TCM and pulse diagnosis Bien Chue, and event on search of cultural roots of TCM"
Professor Xu Mingtang took part in the meeting of study Traditional Chinese medicine and the "Book of Changes" in China and Taiwan. Graduates of the Prague school of TCM visited Institute "Kundawell"
The celebration of the 5th anniversary of the Institute "Kundawell"
1. President of the American Institute "Kundawell", President of the Beijing Institute "Kundawell", President of the International Charity Fund "Mingtang", Founder of Image Medicine and Institute "Kundawell" Master Xu Mingtang. 2. 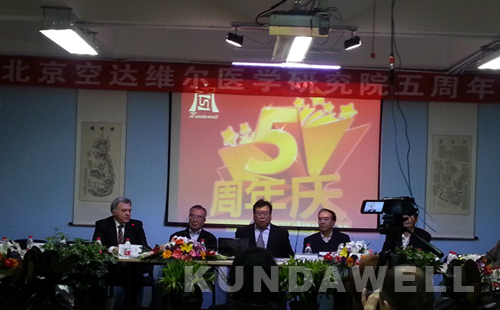 One of the founders of Institute "Kundawell", guest of honor, Mr. Li Gui Roux. 3. Former Chinese Ambassador in the Federal Republic of Yugoslavia, Mr. Panzhen Lin. 4. The guest of honor of Institute “Kundawell”, Representative of Chamber of Commerce and Industry of the Russian Federation in Asia - Belozyorov Nicholay Nikolaevich. 5. The guest of honor of the Institute “Kundawell”, Deputy Representative of Chamber of Commerce and Industry of the Russian Federation in Asia - Kudryavtsev Paul Nikolaevich. 6. The guest of honor of Institute “Kundawell”, Deputy Secretary General of the "World Federation of Chinese Medicine" Mr. Huang Jiangyin. 7. Head of the Scientific Department of International Relations China Association of TCM - Professor Sun Yong Zhang. 8. Deputy Director of the international department of the Administration Bureau of TCM Mr. Wu Jeng Dow. 9. The head of the department of acupuncture and massage Beijing University of TCM, Professor Zhao Bai Xiao. 10. The deputy head of the committee on the study of pulse diagnosis of "World Federation of TCM", the founder of psychological pulse diagnosis, Professor Shou Xiao Yun. 11. The head of the surgery department of the Beijing Hospital, Mr. Zhou Xing Ping. 12. Head of the Department of Skin Diseases in Hospital of Beijing, Mr. Zhang Guan Zhong. 13. Global Advisor of the club's executive directors, Mrs. Ji Wen. 14. Director of Centre for Technological Cooperation of the Chinese Academy of Traditional Chinese Medicine and Science, Huang Ming Da. 15. Head the conference-center of China Association of TCM - Mrs. Wang Chen. 16. Director of Dong Si Hospital, Han Yong Ke. 17. Secretary of the World Association for the Development of TCM Lyubinkuy, Secretary of the World Association of Health of older people, the Deputy Secretary of the Foundation for help older people, Shen Dze. 18. Director of Institute "Kundawell", Western medicine doctor, a graduate Image Medicine specialist of Institute "Kundawell" - Pomazkina Tatiana. 19. Specialist of Research department and Teacher of Institute "Kundawell", Professor of Image Medicine - Smirnova Olga Markovna. 20. Specialist of Research department and Teacher of Institute "Kundawell", Professor of Image Medicine - Kuznetsova Flyura. The founder of Image Medicine and Institute "Kundawell" Professor Xu Mingtang made a report, which summarized the work of the Institute for five years, told about successful research programs and training courses, shared his plans for the future. 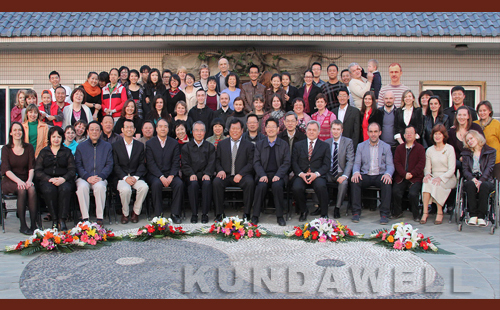 The celebration of the 5-th anniversary of Institute "Kundawell", group photo of participants.